I’d love to think we’re well beyond the complete misunderstanding of women’s rugby which columnist Niamh Horan captured so brilliantly (albeit unintentionally) back in 2014. Hopefully you know the article on which I’m harping because I certainly don’t want to link to it. Sadly, for the last year or so, when I have tried to work the upcoming Women’s Rugby World Cup into conversations with people I know who are usually well on for discussing egg chasing, in many cases I was met with uncomfortable levels of indifference. One thing I hear from multiple sources is that 'it’s never going to be as popular as the men’s game'...to that I say so freakin what? Do people really think there's some kind of contest going on??? With the tournament set to kickoff in a matter of days, I guess all I can do is make a last-gasp attempt to win those people over. The truth is, whether all of us who call ourselves rugby fans acknowledge it or not, women’s rugby in Ireland is growing more and more each year, both in terms of playing and attendance. I’d love to be able to blog on it as much as I do the men’s game, and after the last World Cup I really believed that I could, but alas I can’t afford the extra time throughout the season to stray too far from Harpin On Rugby's remit. Luckily there are others outside the ‘mainstream’ to offer the proper amount of coverage like ScrumQueens and Sportswomen.ie - they give me all the updates I need. 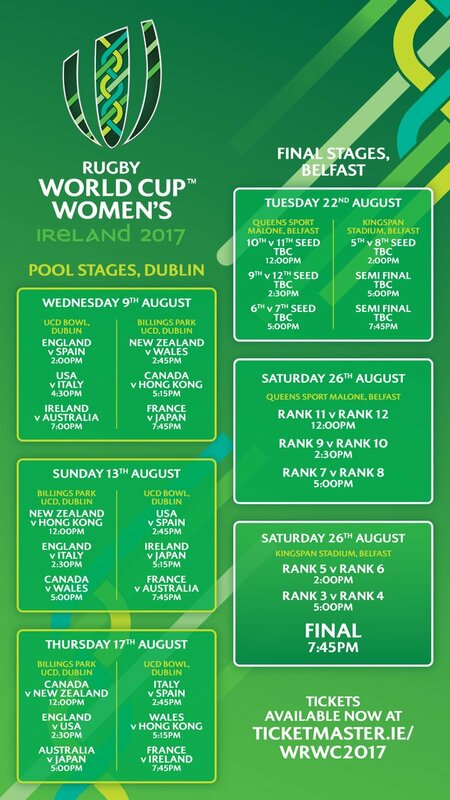 So you won't see me pretending I’m some kind of expert on the women’s game, but I do plan to write up all five of Ireland’s upcoming matches to the best of my ability. And while I’m very confident that the girls are going to do us proud, my critical eye for those articles is going to be no different than for any other. But the way I see it, what’s required from Irish rugby fans over the coming weeks isn’t in-depth knowledge. It doesn’t matter if you didn’t know that in recent years the Irish women have beaten New Zealand and reached a World Cup semifinal before the men, with the small matter of a Six Nations Grand Slam plus an additional championship as well thrown in for good measure. 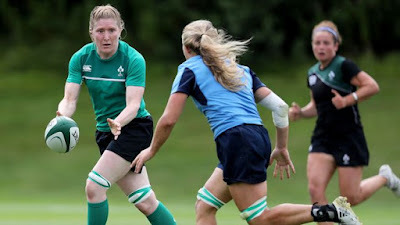 It doesn’t matter if you didn’t know that Niamh Briggs was injured in training and has to miss the tournament [absolutely gutted for her - even more incentive for the girls to go all the way though]. It doesn’t matter if you didn’t know Claire Molloy took Briggs' place as skipper and that there’s a host of top talent all throughout the squad like the tough-tackling centre Jenny Murphy, pacy winger-turned-back row Ashleigh Baxter, or powerful lock Sophie Spence. Seriously folks...this is IRELAND. Playing RUGBY in a WORLD CUP at FULL TEST LEVEL. And it’s AT HOME! 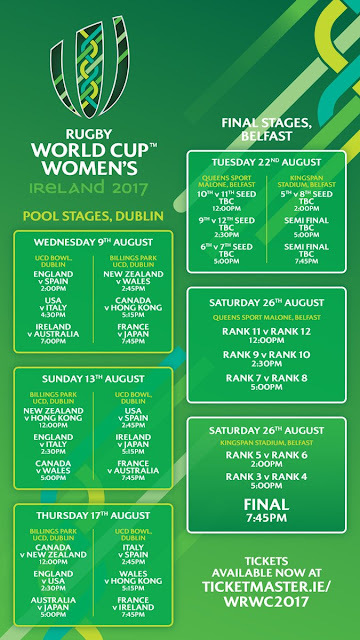 The pool phase is in DUBLIN and the finals are in BELFAST. What more incentive do you need? The English women’s soccer team got beaten last night in the Euros by Holland...did you know the Dutch actually hosted a Women’s Rugby World Cup before we did??? So did Spain. That’s bonkers! We're long overdue, and surely the more noise we make for this tournament, it has to help our bid for another one in 2023. It doesn’t even matter if you're unable to make it to the games - why not head down your local rugby club and watch there instead. Failing that, gather your family and friends around the telly at home [eir Sport have the entire tournament but your licence fee is deemed good enough for the Irish matches on RTÉ]. And in between matches, run amok on social media with the #BringIt hashtag giving the girls all the support you can, as well as talking to people in the 'real world' about the tournament every chance you get, whether they like rugby or not.